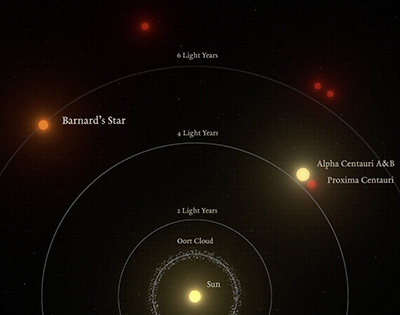 An international team of astronomers has found a candidate planet in orbit around Barnard’s star, the closest single star to the sun and second in proximity only to the Alpha Centauri triple star system. The team, led by Ignasi Ribas of the Institute of Space Studies of Catalonia and the Institute of Space Sciences in Barcelona, used data gathered by various groups over some 20 years of observations, including new observations with the CARMENES planet-hunter spectrograph at Calar Alto, Spain, and other facilities. The results, published November 14 in Nature, provide significant evidence of a planet with mass just over three times Earth's mass (a "super-Earth" planet) orbiting the red dwarf star every 233 days. This would place the new planet at the so-called snow-line of the star, where it is likely to be a frozen world. 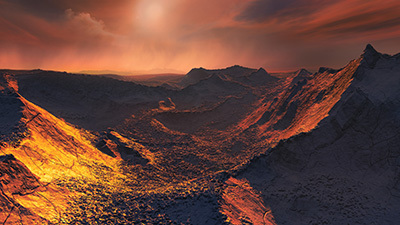 Steven Vogt, professor emeritus of astronomy and astrophysics at UC Santa Cruz, said his exoplanet search team began observing Barnard's star in 1997 using the HIRES spectrometer (which Vogt designed) at the W. M. Keck Observatory in Hawaii. The gravitational tug of an orbiting planet causes periodic changes in the radial velocity of the host star (its motion along the line of sight from Earth), which can be detected with precision spectrometers. "We followed Barnard's star for 16 long years at Keck, amassing some 260 precision radial velocities of Barnard's star by 2013," Vogt said. "In 2016, our European colleague Mikko Tuomi combined our HIRES data with publicly available data from the Europeans' UVES and HARPS spectrometers and began to see faint hints of a 230-day periodicity in the radial velocity data, indicative of a possible Earth-sized planet." At that time, however, the signal was still too weak for the astronomers to claim it as significant and publish their findings. Redoubling their efforts, they added 45 more radial velocity measurements from the newly commissioned Automated Planet Finder (APF) telescope at UC's Lick Observatory, 39 velocities from the Carnegie Institution for Science's Planet Finder Spectrometer (PFS) on the Magellan telescope at Las Campanas Observatory in Chile, and more data that became publicly available in recent years from HARPS. In each case, the additional data made the roughly 230-day signal grow stronger and more significant. The final push came when European astronomers led by Ribas decided to observe Barnard's star intensively with CARMENES, a new instrument that began observations in 2016. CARMENES observed Barnard's star 177 times from 2016 to 2017 in an intensive observing campaign aimed at confirming the suspected planet. "The additional data from CARMENES strongly confirmed the signal, and removed any lingering doubt as to the reality of this planet," Vogt said. “For the analysis, we used observations from seven different instruments, spanning 20 years, making this one of the largest and most extensive datasets ever used for precise radial velocity studies. The combination of all data led to a total of 771 measurements,” Ribas explained. A clear signal at a period of 233 days arose again in a re-analysis of all the measurements combined. This signal implies that Barnard’s star is approaching and moving away from us at about 1.2 meters per second—approximately the walking speed of a person—and this motion is best explained as the result of a planet orbiting the star. Follow-up observations of Barnard's star are already happening at different observatories. According to Vogt, the current data can rule out the presence of Jupiter-sized giant planets closer to the star, but there may be additional planets smaller than Earth-mass orbiting closer in that have not yet been detected. At only six light-years from us, Barnard’s star has the largest apparent velocity on Earth’s sky of any star. Smaller and older than our sun, it is among the least active red dwarfs known and represents an ideal target to search for exoplanets with various methods. "It is the most common type of star in the galaxy—over 70 percent of Milky Way stars are like this dim, M dwarf star," Vogt said. "Because of its extreme closeness, Barnard's star has long commanded an outsized fascination among early hopeful exoplanet prospectors, yet it is too faint be seen with the naked eye." 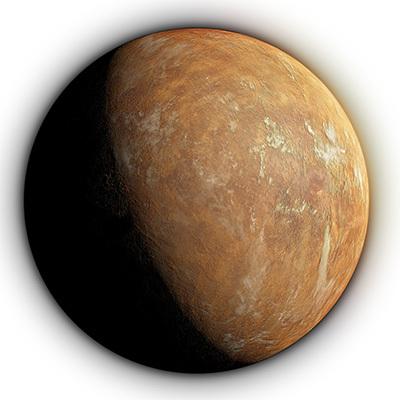 The planet, named Barnard’s star b (or GJ 699 b), is a super-Earth with a minimum of 3.2 Earth masses. It orbits its cool red parent star every 233 days near the snow-line, a distance where water would be frozen. In the absence of an atmosphere, its temperature is likely to be about -150 ºC, which makes it unlikely that the planet can support liquid water on its surface. However, its characteristics make it an excellent target for direct imaging using the next generation of instruments.